Results of the ASSETS/NEEA assessment should be used to guide the development of appropriate monitoring and research which in turn should inform and guide management. A management plan must take into consideration the condition of the waterbody, the sources of nutrients and expected changes in source amounts expected in the future should also be guided by/reflect the certainty of the assessment results based on both temporal and spatial data availability as shown in the figure below. 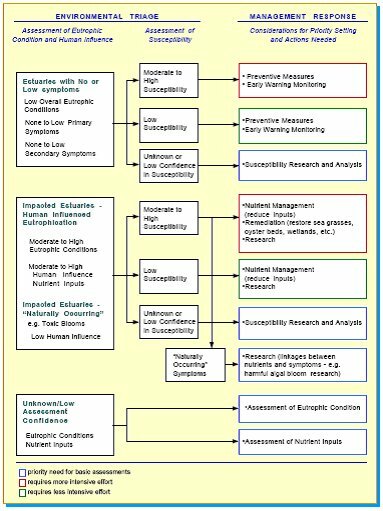 Environmental triage as suggested by the figure should be used to target monitoring, research and management and can be used to ensure best use of limited resources. For examples of the successful use of monitoring and research in the management of estuaries with specific nutrient related problems see the Case Studies page.